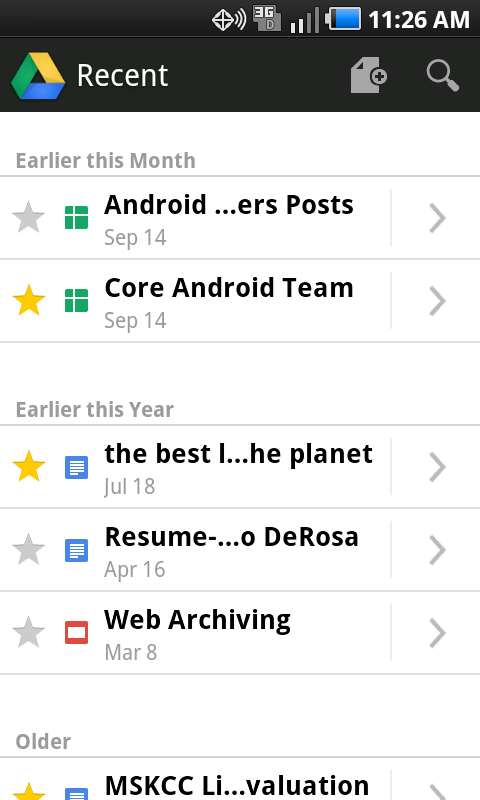 The newly introduced Google Drive now encompasses all of your Google documents, spreadsheets, files and folders. 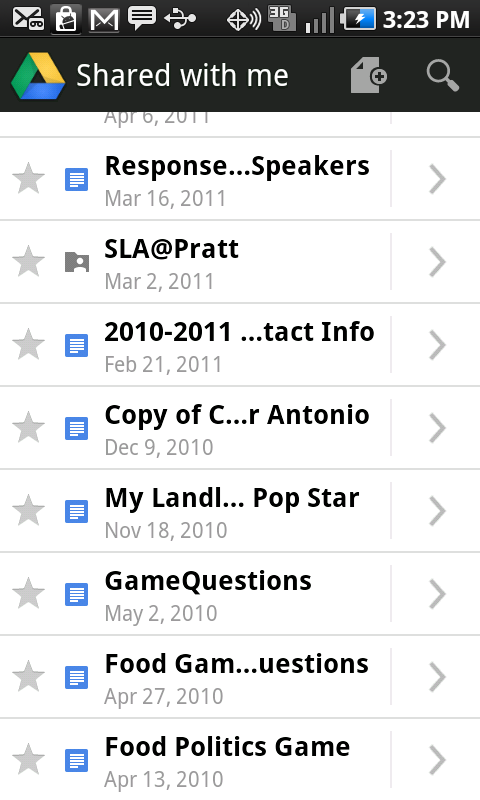 Even newer still, is the Google Drive app for Android. Upon initially downloading the app, you will notice that it is already synced to your Gmail account, as every Android smartphone is. This makes it easy to quickly download and immediately begin accessing and altering your files or folders. Having your documents at your fingertips from wherever you are is beneficial, especially if you are working on a project with colleagues from other institutions or locations, for instance. 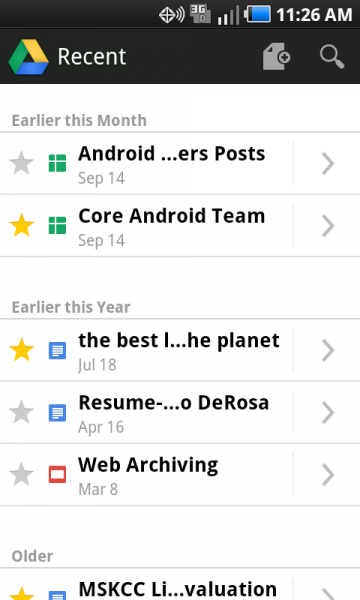 Google Drive allows you to edit and quickly share comments with your group members. 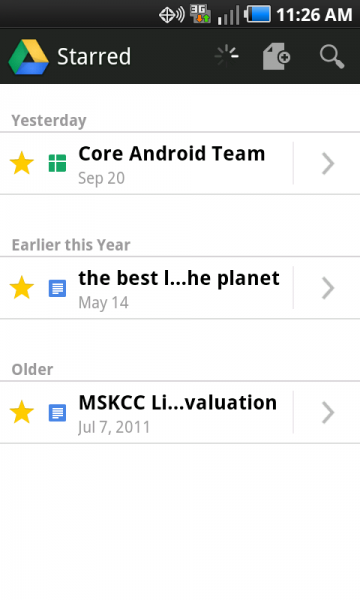 You can also search for a document if you have not placed it into a folder or starred it as a favorite. The search feature (in the upper right hand corner of the screen) works well. 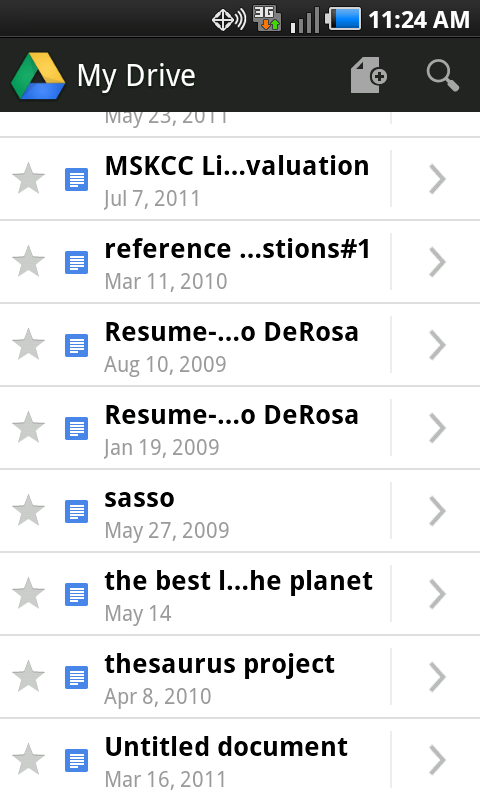 It not only searches the titles of your documents, but it also searches the text of each file. This helps to retrieve the document you are looking for even if you don’t remember the name you gave it. 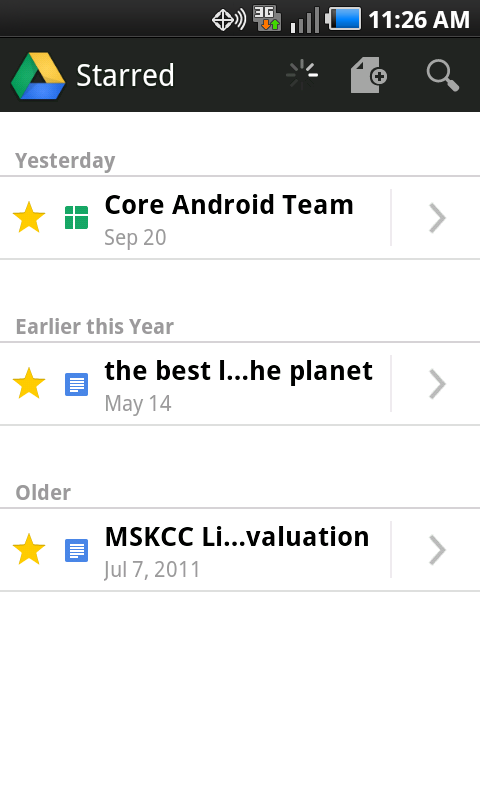 You can also search in the upper right hand corner of the home screen and create files as well. 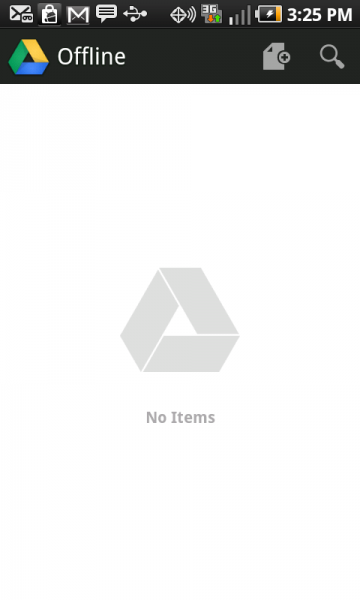 Google Drive works via “the cloud” which makes it possible to begin work on a document on your smartphone and pick it up from your desktop, and vice versa. This also means that a colleague can work on a paper from their desktop and you will see the changes made to the shared document on your smartphone using the Drive app. This web-based application is protected by username and password encryption (your Gmail account) to ensure the security of your documents. Even so, as this is application uses an active Internet connection, so users should be aware of Protected Health Information (PHI) and HIPPA-protected data in their files. Some institutions’ IT departments do not support cloud-based servers like Dropbox, Evernote, and Google Drive. 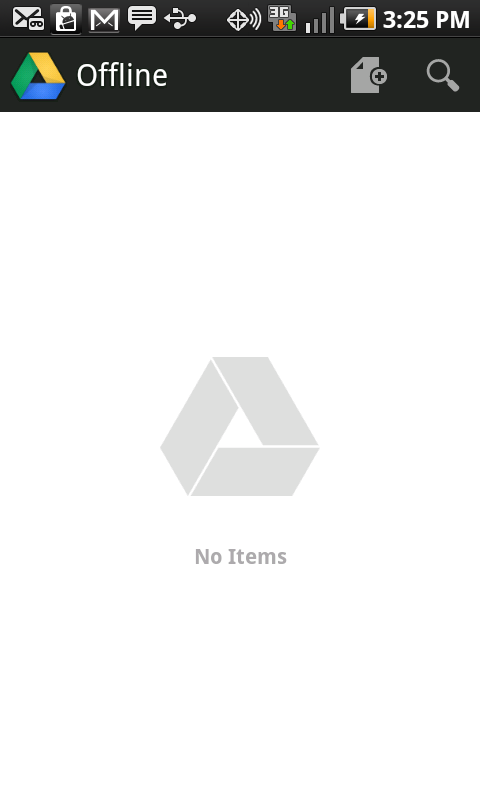 The real strength of Google Drive lies in its ability to handle shared Google Documents. 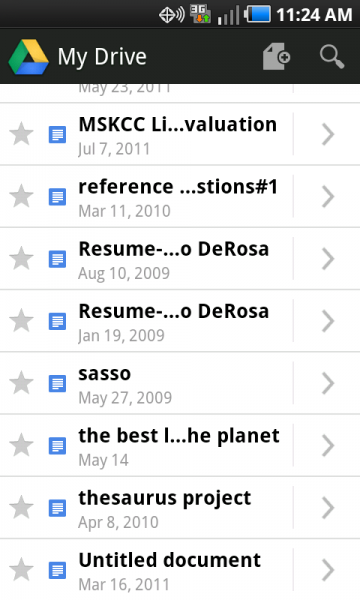 Google Drive is very similar to Dropbox in the sense that it is a great tool to manage your files, providing the all important wireless link between mobile device and home computer. 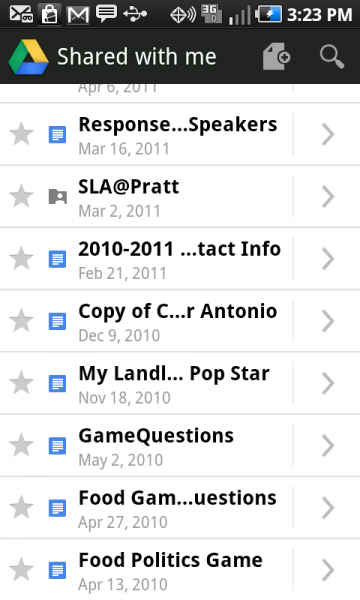 The major difference is that with Google Drive, you can edit the documents on the go. Anyone who has experienced the power of collaboration using Google Docs will be impressed with this app. Collaborative tool for research projects, papers, brainstorming, etc.